Thematic classes are organized periodically, opening new horizons for you. Black & White. Throwing two combined colors of earthenware will give you a striking swirled effect inside and out. (This is not mere surface decoration). In order to succeed, you need to center and pull up the clay efficiently : otherwise, the colored strata will become a monochromatic blend. Porcelain. 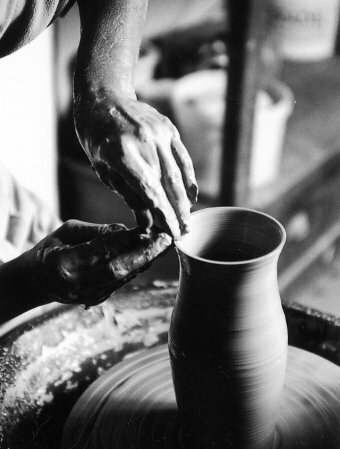 Soft and extremely sensitive to the potter's touch, porcelain can also be unforgiving. Learn precise gestures for throwing, and also advanced techniques for optimal trimming. High-temperature glazes. Please note : these modules are reserved for experienced throwers who have the required level. Participation subject to my approval. to decorate with them. Having learned how to use colored oxides, you'll be all set to continue experimentation on your own: why not use them to tint balls of clay? or to create your own palette of glazes from a basic white?